American Diabetes Association, 9781580405454, 352pp. 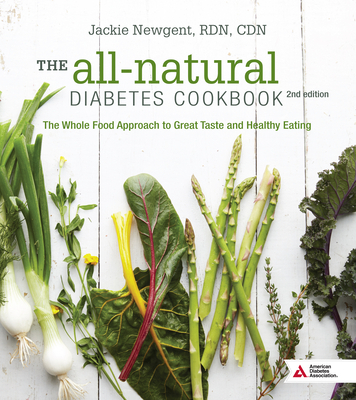 Absolutely nothing is artificial here Naturally delicious fresh foods, whole-food ingredients, and full flavor is what The All-Natural Diabetes Cookbook, 2nd edition is all about. Relying on artificial sweeteners or not-so-real substitutions to reduce calories, sugar, and fat is a thing of the past. Luckily you won't find any of that in this book--from breakfast to dessert and everything in between. What you will find here is a just-right amount of plant-based goodness, well-rounded nutrition, and simple-to-fix recipes, creating such tempting dishes as Heirloom Caprese Omelet, Party Spinach Dip, California Chicken Burger Sliders, Hibachi Slaw, Baja Bean Chili with Guacamole, Horseradish Pork Tenderloin on Naan with Arugula, Farmers' Market Mushroom Flatbread Pizza, Thai-Style Halibut with Mango Relish, Cajun Grains, Green Juice Smoothie, Peppermint Brownies, and more. Each recipe is ideal to be enjoyed by people with diabetes, pre-diabetes, heart health issues, or simply looking to improve their diet.